Cut out a hole from the center of one of the bread slices with a large 3-inch cookie cutter or the mouth of a glass. In a medium skillet, melt butter over medium heat and place breads over melted butter. Carefully crack 1 egg over the bread hole and cover the skillet with the lid. Cook for 4 minutes or until you reach your desired consistency. Remove bread slices from pan and place on a serving plate. Spread mayonnaise on the bread slice without the cut out hole, layer with Romaine lettuce, tomato slices and bacon strips. Place second bread slice with egg on top of sandwich. Serve and enjoy! Instead BLT, try a ham and cheese sandwich instead. The trend "with an egg on top" has been around for a couple of years now. I've seen a creamy sunny side up egg cracked on top of pizzas, hamburgers, rice and even in soups and stews! 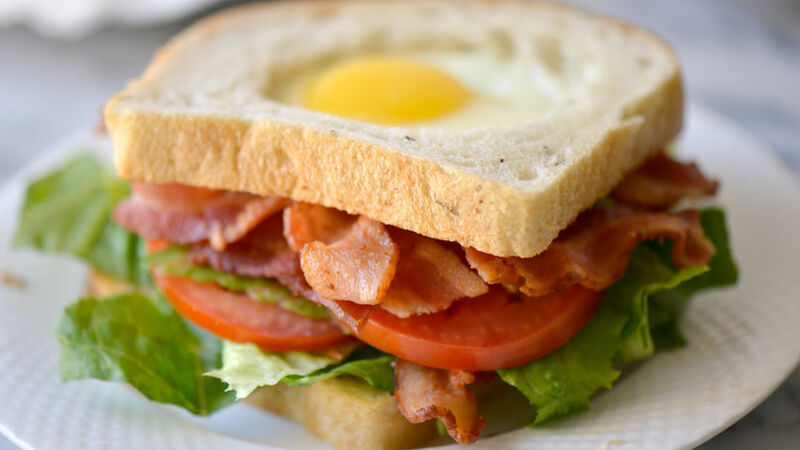 I decided to make a variation of a BLT sandwich with an egg not exactly cracked on top but rather nestled into the bread "in a hole" style. The flavor combination is outstanding and a perfect meal for brunch or lunch.